The 2011 EuroLeague competition reaches its climax with the quarter-finals. Ros Casares come into the tie against Bourges Basket as favourites because of their number two seeding and home court advantage if a third game is required. Ros Casares have an all-star roster but have made many changes during the season with players coming and going. However their last change was the hiring of Natalia Hejkova as head coach, a day after former coach Jordi Fernandez had seen the team get past MKB EuroLeasing to qualify for this series. The situation at Bourges Basket has been calm with the same nine players and the coach, splitting their time playing in the EuroLeague and the LFB. For Bourges Basket to have any chance of qualifying for the final four they will have to win at least one game on the court of Ros Casares. It will not be an easy task as they lost in their first meeting last November (47-74). Bourges have a perfect record at home this season with seven wins. Katie Douglas is leading the scoring for Ros Casarea with an average 17.6 points. She is also hitting 37% from the land of many with 25 successes. Rebekkah Brunson follows with 16.7 points and 9.8 rebounds. 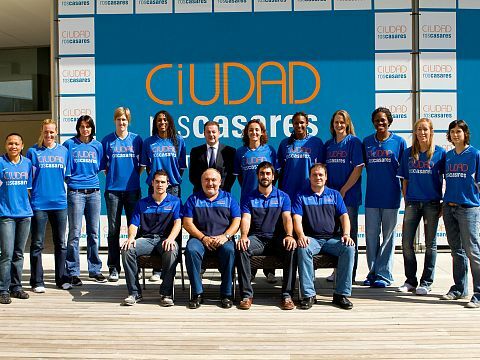 Spanish international Marta Fernandez is the third player averaging in double digits with 11.8. Former French international Edwige Lawson-Wade is contributing 8 points while former Bourges Basket favourite Laia Palau is scoring 6.5 points and dishing out 3.5 assists. For Bourges Basket Cathy Joens is leading the scoring with 14.8 points while Nwal-Endéné Miyem and Styliani Kaltsidou are the other player averaging double digits with 12.5 and 11.7 points respectively. Captain Emméline Ndongue is leading the rebounding with 7.3 while scoring 9.3 points.